Here's a sprite I made, planned to use on Pixeljoint as avatar... I rushed uploading a not finished version to test something about the avatar system on there..
Today I decided to polish it a little... here's the progress, I think it still has some issues, like the anatomy of the left arm/shading of it..
stance is pretty awkward, not sure what you were you trying to go for. AA is pretty bad, what is the background colour it is intended to be used on? pretty hard to explain in words what's wrong with the anatomy, since it's such a small picture (and body frame), but here's a quick edit, maybe it'll help a bit. You should look for some references if you can't remember where every muscle originates from and inserts, or simply study anatomy in general; it'll help you a bunch. also, y no leg muscles? 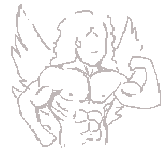 it's meant to be a silly sprite, not really perfect anatomy/ perfect muscles.. and not supposed to be hulk, but a skinny defined guy. Another edit. I still don't like the lower part of the wings. I think that adding another dark color will be useful to achieve better AA. I don't have the time to fix every pixel, but I hope that this will be helpful. I think this is final.. I know you are feeling done with this so I hope you don't mind my throwing in my two cents, anyway. The thing that gets me the most is the dispassionate look in his face. Flexing like this, I feel like either he should be showing some seriousness/strain/concentration in his face or he should be giving a cheeky smirk and a wink. It's fine that he's not engaging the viewer with his gaze; he could be thought of as engaging another character or, as a forum avatar, looking at a post... but that fact that he's not engaging the viewer seems to make him feel extra dispassionate. You mentioned to Night that you don't want him to be a hulk but Night's edit wasn't that much bulkier than yours. I feel that the width of his chest and abdomen, combined with the high-contrast shading down his stomach and sides, make it seem like he has a thick, bulky, upper-body that goes away from your sketch and your desire to draw a "skinny" but "defined" character. The little bit of wing visible under his right arm in the latest edit is easily confused as being a deltoid or something, adding further bulk to the character. Lastly, I want to second the comments about his legs. It feels really awkward, to me, for him to be like that, regardless of he is standing or floating. It's weird to me that his legs are apart like they are, it's weird to me that he his feet are so strongly turned in towards each-other. It doesn't feel like part of his "flexing" pose and it gives him this awkard backwards imbalance. I tried making something of an edit but I just can't pixel at this level of detail - you did a great job with anti-aliasing and showing detail and muscle definition. I'm afraid I didn't care for my results - I'm not terribly good anyway - and I'm also short on time. Reason I'm feeling done is, I'm not getting any edits I was hoping for, I got to this point and I know most of the things that are wrong I just can't fix them.. Nights edit is pretty good but I think it changes too much of my idea..
And since avatar on pixeljoint breaks my 100x100 preview streak (70), I decided not to upload the avatar.. So any progress on this is just study/practice and not to be used.. I like the idea of changing his expression, a lot.. I didn't think of that.. Probably the reason it comes out more hulk-like than mine, is because of the squareness of the sprite and no outline makes him look wider. The little bit of wing, you are right it could be read as deltoid, but I kept it really dark to make it look like it's behind him.. I don't know what else I could have done to make it look better.. But I guess that's bad effort, since that wing part isn't necessary and in fact it probably shouldn't be there..
Hehe I was just trying to avoid covering abs or wing, and wanted to fill that space under the wing, that's how the pose happen.. I totally agree that the left arm is a mess, the left arm is main reason I posted the sprite here.. But it feels like I just can't do better on this small sprite. Haha now you see my pain ! And thanks for compliment about AA, I'm a little confused if it's good or bad now..
Well I liked reading your critique, it's really good, it does give me some ideas and some pointers for future work.